The architecture at Shearwater was designed to reflect the natural beauty of Florida. The Florida Farmhouse is a traditional home, with a simple yet classic sense of style. Florida Bungalow and Craftsman homes feature wide porches perfect for casual southern living. Coastal Traditional homes pay homage to the coast, with tons of natural light. And for a more exotic feel, the Spanish Craftsman has a unique Mediterranean flair with stucco siding and exposed rafters. 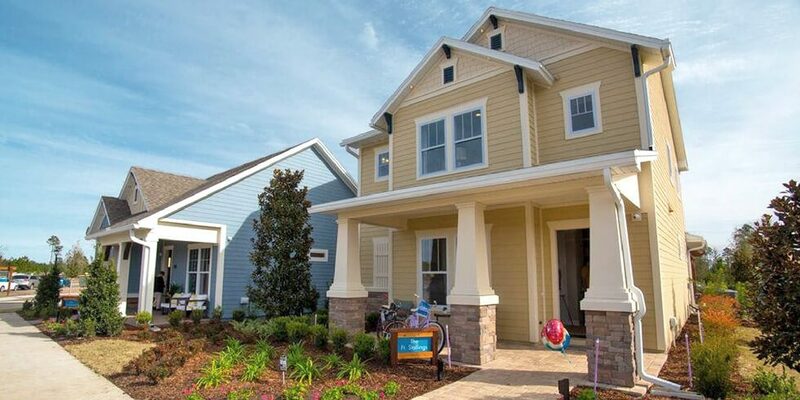 Most homes at Shearwater feature either a front or back porch, or both. These not only extend your living space, but porch living also helps create a close-knit sense of community. Chat with neighbors out for an evening stroll, read a book with a glass of iced tea, or just sit back and enjoy the sounds of crickets at night. Homes at Shearwater feature natural landscaping that not only enhances curb appeal but also the surroundings. Native plantings like gardenia, juniper and palm trees come together to create a lush environment. Plus, all homes at Shearwater include an irrigation system with a timer and rain sensor, so maintaining your lawn has never been easier or more “green”! Your home should look beautiful and inviting both day and night. At Shearwater, subtle lighting accents entryways and features without overwhelming the streets with light. Exterior lighting is even shielded from adjacent lots, so no need to worry about the neighbor’s light preventing you from getting some much-needed rest. Driveways and walkways at Shearwater are primarily composed of brick paver with a trim pattern. A walkway from the driveway to front door creates interest and adds a level of functionality, and sidewalks make it easy for residents to go on a stroll and enjoy the neighborhood. Tour Shearwater’s model homes seven days a week to see how Shearwater’s neighborhoods are a step above the rest. To learn more about one of St. Johns County’s fastest-growing communities, join our Interest List.